What is with our addiction to Wifi? Oh, yes – the endless barrage of emails and the incessant need to find out what is going on over on Facebook. It doesn’t help that now, you can get Wifi almost everywhere – even at 30,000 ft – and bosses/friends/family expect updates from you even before your taxi has reached the airport. And of course, sometimes you have to travel without your children, or be away from home under less-than-ideal circumstances (illnesses, etc.) so keeping in touch via tools like Skype or Facetime is important. How do you find free Wifi on your hols? Here are some tips to get you going. Do you have a phone that doubles as a hotspot, so your significant other can share and keep the roaming fees to a minimum? Do you plan on doing some work in the hotel, and yet keep booking hotels with Wifi only in the lobby? Does your home internet provider or mobile phone provider offer you a hotspot network access in the destination you are headed for? Google has a lot of options too. 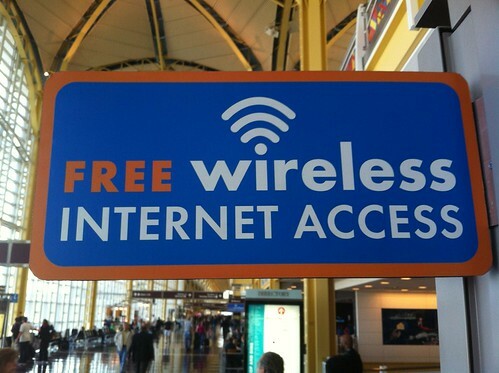 I know, it’s ridiculous – buying expensive equipment so that you can enjoy free Wifi. But, if you’re in very old hotels, or in more remote places where the Internet is just not ubiquitous, this can be handy. I like this model from Alfa, which is less than 25 quid. What it does is add a higher-powered Wifi receiver to your computer, so your laptop can access routers that are a lot further away from you. These need a USB connection, so they don’t work for iPads or phones. Sometimes, you have to pay. On months where I’m on the road a lot, I activate my subscription to Boingo. It’s very cost effective when it comes to Wifi hotspots, and their international coverage is very comprehensive. If you don’t think you’ll have any free options, take a look at their directory – it might prove a lifesaver and headache-preventer. And wouldn’t you rather be doing holiday-things (margaritas.. surfing… back to bed..etc) rather than wandering the streets looking for Wifi? Sometimes, you don’t need the Wifi. I hate to break it to you, but if you’re reading this blog, the world will probably function just fine if you don’t check your email for 48 hours. Go and enjoy your holiday – we’ll be here when you get back.